"41CE12-194, Burial AH-18" by Timothy K. Perttula and Robert Z. Selden Jr.
DECORATION (INCLUDING MOTIF AND ELEMENTS WHEN APPARENT): There is a single horizontal engraved line at the top of the vessel body and below the vessel collar, and another horizontal line near the base. There are four narrow vertical zones or bands between the two horizontal engraved lines, and they are filled with cross-hatched engraved lines. Hume Engraved, var. 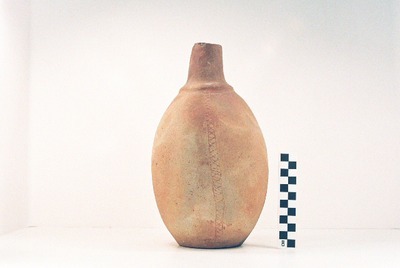 Hume bottle from the Jim P. Allen site.